Prepared under the aegis of the Food and Agriculture Organization of the United Nations (FAO), this text presents a fresh and comprehensive look at agricultural development policy. It provides a clear, systematic review of important classes of policy issues in developing countries and discusses the emerging international consensus on viable approaches to the issues. Topics covered include agriculture’s role in economic development, the objectives and strategies of agricultural policy, linkages between macroeconomic and agricultural policy, policies for the agricultural financial system and agricultural technology development. Upper level undergraduates taking courses in Economic Development and International Development and graduates taking courses in Agricultural Development, International and Economic Development, Natural Resource Management and specialised topics in agriculture will find this text of great interest. It also serves as a reference for professionals and researchers in the field of International Development. 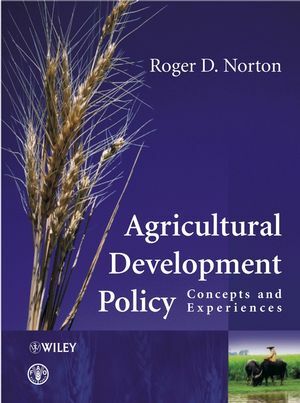 Roger D. Norton is the author of Agricultural Development Policy: Concepts and Experiences, published by Wiley.